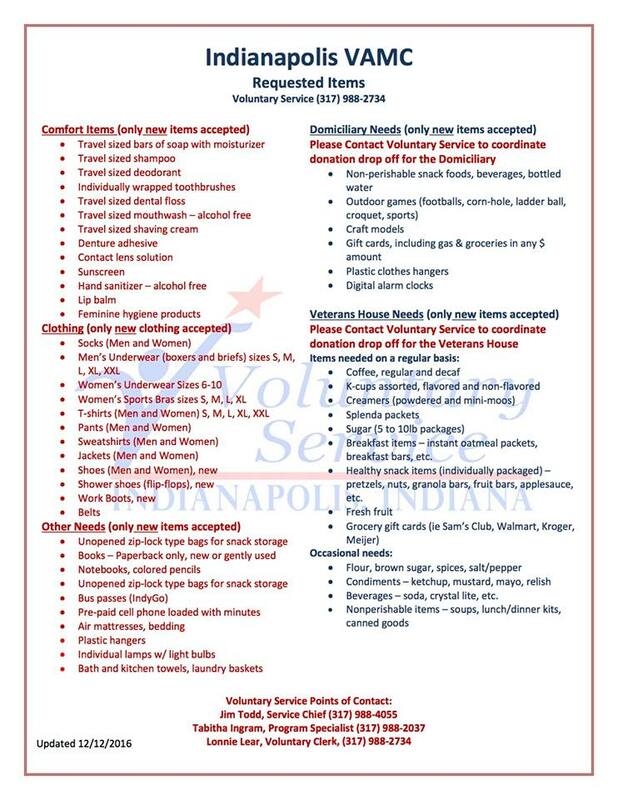 Below is a list of needed items for the VA Hospital & HVAF of Indiana for homeless Vets are. Currently, they need men’s t shirts, sweatshirts & Jackets – 3X & larger; winter items – hats, gloves, scarfs, ear muffs. Also unopened body wash, towels & washcloths. They want paperback books (no hard cover), & magazine, no political, or girl magazines – ie, cosmopolitan or anything similar. They can always use individual packages of healthy foods. Things they DO NOT NEED at this time are socks, bar soap, or slightly used toiletries (i.e.shampoos, lotions, etc from hotels). You can drop off any items to Post 79 & be assured they will be delivered to the cause.